This picture is Copyright © 2012 by Sabrina Moles. Fang is a character Cobyright © by Square Enix. Please, don't use it for avatars, layouts etc. without my permission. She has to be one of the most attractive Final Fantasy women of all time. Very niiice!!!!! Love the pic. I wish you come on the frontpage!!! you really deserve it!!! 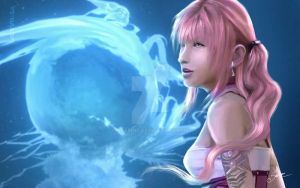 Fang is the best character of FFXIII, and you are a great artist Really, great great job!